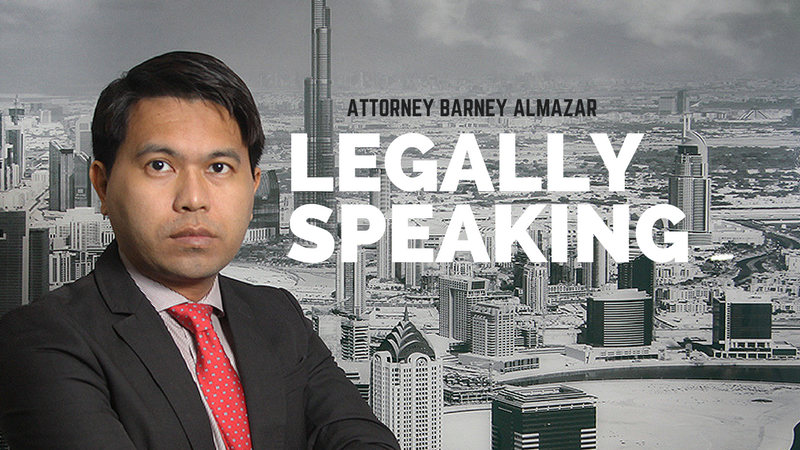 In his weekly column on ExpatMedia.Net, Dubai-based lawyer Barney Almazar answers the most common questions regarding your legal options in various cases related to living and working in the UAE. Attorney Almazar is the director at the corporate commerical department of Gulf Law in the Middle East, Philippines and United Kingdom. He holds a UAE legal consultancy license and is a lifetime member of the Philippine Bar. Almazar graduated from the University of the Philippines, College of Business Administration and holds a Masters in Business Administration and Juris Doctor degrees, specializing in International Business and Euriopean Union Law (Instiute of Advanced Legal Studies, University of London). Prior to moving to Dubai, Almazar worked at JPMorgan Chase and PricewaterhouseCoopers. He heads the monthly legal aid clinic at the Philippine Embassy in Abu Dhabi and Consulate in Dubai. He has given free legal assistance to more than 6,000 Filipinos in the UAE since 2014.